World Fair Trade Day is taking place on 12 May 2018 and is a celebration day well worth getting behind. is an inclusive worldwide festival of events celebrating Fair Trade as a tangible contribution to sustainable development, aiming to get more consumers, retailers and brands to re-think their supply chain and start using products that are sustainable and fair in their production. 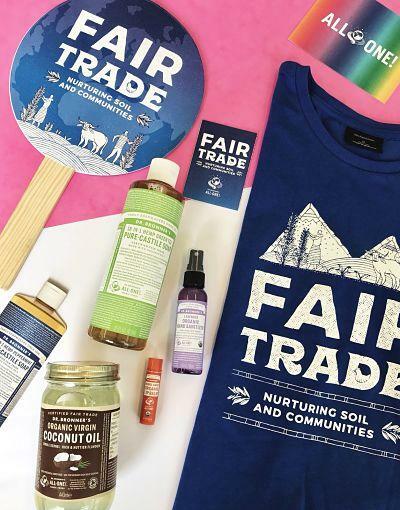 Along with a Dr. Bronner’s t-shirt and the cult favourite Pure-Castile Liquid Soap, loved by the public and celebrities alike, including Bobbi Brown, Meghan Markle and Woody Harrelson, your fair trade bundle will include an Organic Lavender Hand Sanitiser, which is tough on germs but super gentle on hands, and an Organic Lip Balm, which hydrates lips using organic jojoba and avocado oils. You’ll also find Dr. Bronner’s new and first food product: Whole Kernel Organic Virgin Coconut Oil. This Coconut Oil uses the whole kernel of the coconut, giving it a nuttier flavour with more antioxidants, minerals and vitamins – making it even better for high-heat cooking. For your chance to enter the competition simply send an email to ecohustler@ecohustler.co.uk and let us know what your favourite Dr Bronner's product is and why. You can also enter on Facebook or Twitter - just give us a shout and make sure you hashtag #WorldFairTradeDay and mention @DrBronner. The winner will be selected next week and prizes sent straight out. Dr. Bronner’s is dedicated to using regenerative organic farming methods and creating products that are natural, organic, fair trade, and healthy. Dr. Bronner’s Organic Virgin Coconut Oil is directly supplied from Dr. Bronner’s own sister company, Serendipol, a farm in Sri Lanka’s “Coconut Triangle.” Serendipol was founded in 2006 following a tsunami relief effort as part of Dr. Bronner’s desire to create a cleaner supply chain by sourcing all of their major raw ingredients from fair trade and organic sources. The ongoing development is part of Dr. Bronner’s commitment as a fifth generation soap-making family to carry on the social and environmental ideals of company founder Emanuel Bronner through integrating social initiatives and environmental stewardship into their business model. Since its founding, Serendipol has become the world’s foremost producer of certified fair trade and organic coconut oil. The company currently purchases from approximately 1,200 farmers who farm organically, a practice initiated by Serendipol that has resulted in improved soil fertility and increased yields. The company’s staff has grown to 300 individuals who enjoy working conditions and compensation uncommon in the industry, proving that business can be socially responsible and environmentally sustainable.